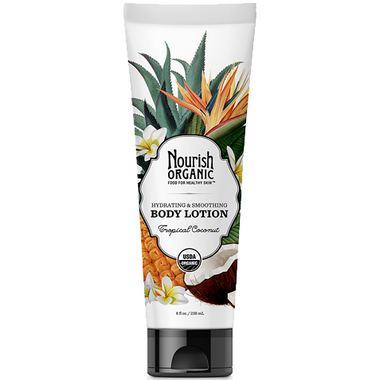 Smooth on this soothing, naturally scented Nourish Organics Hydrating and Smoothing Body Lotion made with organic aloe, rice protein, acai, essential oils and Vitamin E. Perfect for even the most sensitive skin. I love nourish organic products but I find the scents are not to my liking. If you feel the same definitely purchase the coconut scent it smells amazing. This brand one of the most natural you can find and does an amazing job.